Homemaker Highlights: Softy hand sanitizing wipes. I was sent this product in return for my honest opinion on their product. I was recently asked to review Softy hand sanitizing wipes and it was a review that I really enjoyed. 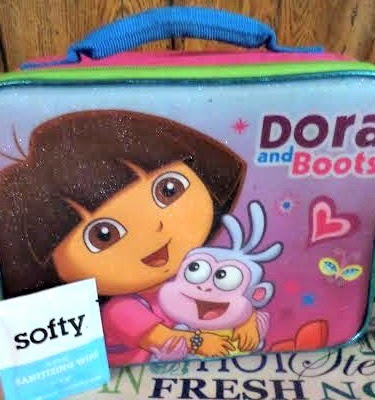 There are so many ways to use these wipes. I popped them in my girls' lunch boxes, my pockets when on the run, in my purse, in my kids' book bags, in Barry's work bag, and even in the cup holder of my car. They are so easy and compact to carry. The uses are endless from sanitizing your hands before a meal (if you aren't near good ole soap and water), wiping down grocery carts, and taking them with us when we take Nero for is walks. These wipes are alcohol free, so there's no drying out feeling on your hands or feeling like you need to wipe them off on a towel after use. There's no scent and the towels themselves are just cotton soft, very moist. They are also infused with vitamin E and aloe, which is quite refreshing on the skin. You can find these wipes HERE.